Extreme changes in any weather condition can be rough on your heating and cooling units. 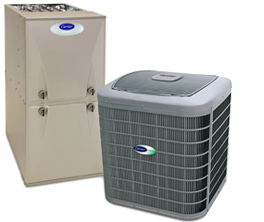 Your units have to work harder to cool down air with high humidity or to warm dry air to a comfortable temperature. Luckily, our experts at Provincial Heating and Cooling are up for the challenge of establishing an enjoyable internal climate for your Saint Andrews home or business. Our factory-trained technicians will use their expertise to install or repair dependable systems to provide comfort to your family throughout the roller coaster of Saint Andrews weather. As a part of the Saint Andrews community, we are here to support you. Provincial Heating and Cooling values our customers and the neighborhoods they live in, providing environmentally responsible services and products on every job. We are a Carrier Factory Authorized Dealer for the world-class Carrier products- a rigorous process we were proud to endure to offer our customers in Saint Andrews the best services possible. But we don’t discriminate! Our team will repair all makes and models your space uses to get the best result possible for the season. Provincial Heating & Cooling has provided exceptional HVAC services to the Winnipeg and surrounding areas for over two decades! Our award-winning team is committed to becoming leaders of the industry in growth, quality work, and suburb customer service. With our Pro Service Plan, preventative maintenance of your HVAC units is affordable and convenient. Our expertise is available 24hrs a day with a 100% Satisfaction Guarantee! Don’t wait for the beautiful, yet volatile Saint Andrews weather to cause problems with your HVAC systems. Contact us today for a free estimate of your residential or commercial property! I just wanted to pass along my thanks for the great work the two installers did installing my new furnace and A/C. They were very courteous and professional. The work done was very neat and tidy and they answered all my questions. I am very pleased. Thanks Again.